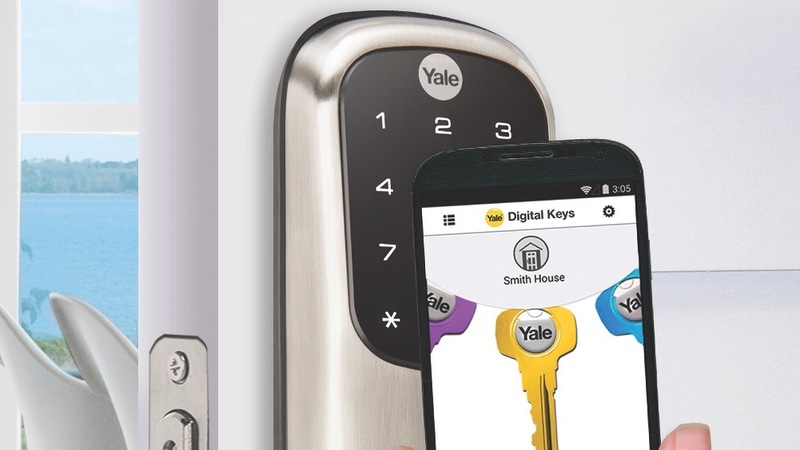 Yale has updated its Real Living line of digital Bluetooth security devices with the Assure Lock, a residential door lock that you control wirelessly using the Digital Keys app on iOS and Android. Most exciting is that it works with the Samsung Gear S2 smartwatch. When unlocking the Assure Lock with a Gear S2, users touch the screen to activate the digital key. Then, touch the lock screen to unlock the deadbolt. It isn't only for Samsung's smartwatch, though. It works with iOS and Android phones, as well. Via the compatible app, one can use gesture controls on smartphones. The 'Twist and Go' feature works by holding your device vertically and then twisting it 90 degrees. Or, you could unlock the door using the touch capacitive screen right on the Assure Lock, but what's the fun in that. The app allows users to send temporary digital keys to others so they can unlock the door without having to be there (or leaving a key under the rug). You can also assign colors and pictures to different keys for different people, manage when each person can access the lock, receive notifications when a key is used, and revoke access to keys at any time. Additional features include no limit on users with digital keys, the lock can store 12 different codes (five come free with the app and additional codes can be added for $2 each), and one key can be used with multiple locks (so you don't have to use a different key for the front and back door). There is easy access to a quick-charge panel at the bottom of the lock so you can attach a 9-volt battery to the contacts incase the battery dies and you need to unlock the door before replacing it. Although the only smartwatch it appears to work with right now is the Samsung Gear S2, it is likely the company will update its Android and iOS app for compatibility with their related smartwatches at some point in the future. Yale's Assure Lock will be available in polished brass, satin nickel, and oil rubbed bronze sometime in the first quarter of 2016 for $225.